Understanding acoustics is not trivial because we can't see the sound waves. A simple propagation of waves in one or two dimensions can be explained using a hanging rope or throwing a stone in water, but phenomena like standing waves in 3D or phase relations are harder to explain. 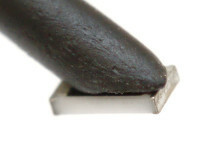 This article describes a little electronic gadget to visualize sound waves. It's called PhaseBrush because of its working principle. By moving (brushing) it around in the sound field, the LED colour will visualise the waves in real time. You can track the wave fronts or find the silent valleys. 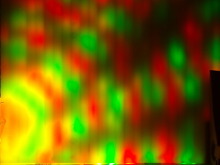 If you capture the brush motion with the changing colours in a long-time exposure you will obtain a 2D image of the acoustic as shown in the title image or the experiments presented below. All this can be done with a microphone and post-processing too, but in an incomparably boring and tedious way. 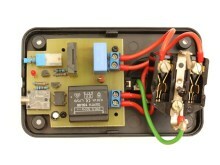 This article describes a microcontroller based digital door bell circuit that plays different sounds from an SD card. Instead of the boring "ding-dong" you can play your favourite song, a cool 303 acid sound, a Stephen Hawking phrase, a drum solo, animal sounds or what ever comes into your mind. 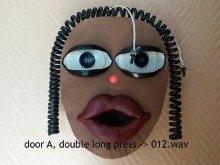 The video above shows an example implementation of the digital door bell in a mask inspired by this guy. While playing with the first prototype I noticed that having just one sound is quite boring and doesn't allow to distinguish visitors with their different ringing habits. 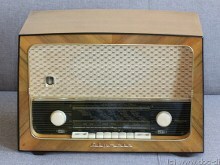 The idea of building a DIY internet radio embedded in an old tube radio came across my mind a long time ago. Unfortunately back than setting up Linux on an ARM system was something for the real hackers. I saw no chance to finish such a project with a good result in a reasonable time. Things changed and the Raspberry Pi become the ARM Linux system for the masses. With the unified hardware and an excellent documentation days of desperate debugging turned more into a copy-and-paste procedure. When microcontroller circuits interact with real life, switching lamps, motors or solenoids might become necessary. Switching such "non-digital" loads is usually a bottle neck in DIY projects, because nobody wants to have 230V or 110V swirling around on his perfboard. Driven by the need to control a big lamp for time lapse shooting with the SmaTrig I designed a compact power switch useful for DIYers and electronics hobbyists. 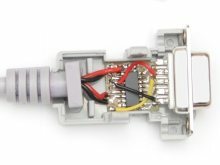 In the following I'd like to share with you the thoughts and ideas that went through my mind during the development of the device and provide you all data necessary to build your own switch. In this article a simple inductance meter is presented. 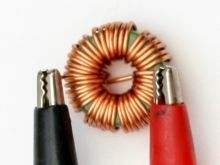 It comes in handy when winding your own coils or transformers as needed in switching power supplies. It becomes even necessary for winding flyback transformers where the air gap must be adjusted. The oscillator circuit presented here is not my own creation, it can be found on various web sites. My contribution is the PCB design, the additional range switch and the buzzer. When programming microcontrollers debugging is inevitable. Options like JTAG or DebugWIRE exist, but they are usually too expensive for most entry level DIYers. Another simple and controller-independent option is to utilise the USART for debugging. It's integrated into nearly all of today's microcontrollers. The only problem here is to convert the two serial signals RXD and TXD from the controller levels, usually TTL, to the EIA-232 levels as found in the serial port of every PC. Fortunately there is the MAX232, which converts signals between both levels.